The Patient Portal provides patients instant access to their medical information provided by the practice and allows secure communication between the office and patients or other practices. This page will walk the user through how to setup the patient portal for use by the patient and office. Click on the “Practice Portal” drop down menu and select “Portal Setup”. Next on the Practice Setup window click Direct Setup. Next Click the Add button on the Practice setup screen. This will bring up the Direct user window. Enter the user name (this will also be the email address and cannot contain spaces). Direct Active: This indicates if the user is an active direct user. Admin: This determines if the user will be an Admin for the patient portal. List Name in Provider Directory: This will add the providers name to the direct email directory. Provider: This is automatically checked or unchecked depending on the selected user. 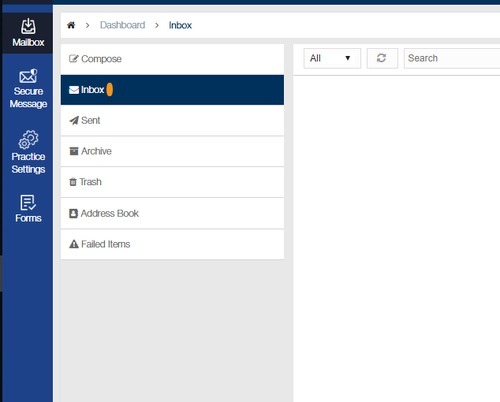 Once you have completed all selections click the save button, after the user has been save you will get a pop up indicating that the user was successfully created. Next click Direct Setup and on the pop up screen click Vetting Process. This will take you to the Updox vetting screen where you will be asked to verify your Identity. This is a requirement for setup and use of a direct email account, if not completed the practice will not be able to use direct mail. 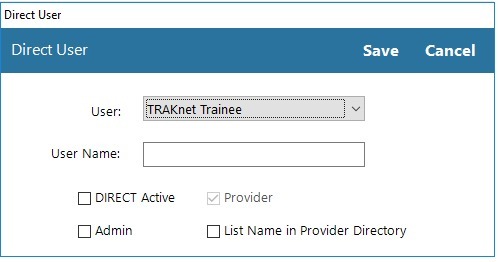 The last step is to click on the Practice Portal menu and select Secure Message Inbox. Please note the patient portal users must sync to the patient portal, if the patient portal does not initially open please try again in 10 minutes as the sync occurs at regulaly scheduled intervals. For local clients the push process must be performed manually prior to logging into the patient portal. Please click the File drop down menu and select "Log Out and Push Portal Data" to perform the required data push. Once on the practice portal click the Practice settings in the left hand menu. Scroll down to the bottom of the screen and click “Edit”. 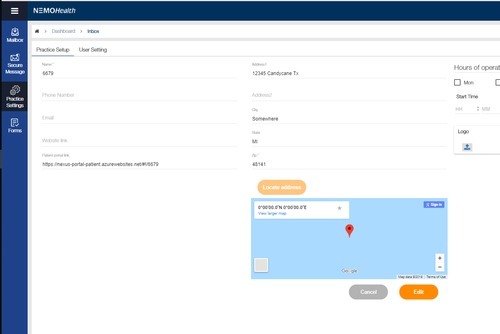 At this point it is recommended that you verify the Practice address, set working hours, add any logo images, and click the locate address button. This information will be visible to you patients when they log into their portal link. After you have verified the information and set what optional items you would like click save. Once save has been clicked the patient portal is ready for use by the practice and the patients.